And it’s exclusively for our members: just one of the benefits of signing up as an RTFHS member and paying an annual subscription. Romany Routes is published four times a year: in March, June, September and December. Every edition is packed full of research tips, family history and social history features, old photos and things that members have discovered about travelling people and their own ancestors in old newspapers, parish registers and censuses. Like a free sample of what’s inside? Here’s a free sample of the kind of articles, news and photos you can enjoy every quarter as an RTFHS member: Romany Routes Taster Edition. What’s been in Romany Routes before? Buy the first nine complete volumes of Romany Routes (Volumes 1 to 9) on CD-ROM. Head to Publications to find out more. See online indexes to Volumes 1 to 5 of Romany Routes here. 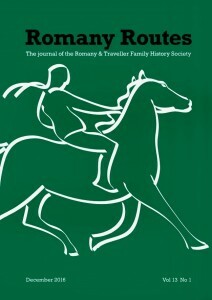 Past issues of Romany Routes are sometimes available to buy too. Check this RTFHS Romany Routes order form for details. Like to contribute something for publication? Click here for more help and ideas from our Romany Routes Contributor’s Guide 2016. And then put pen to paper or head to the keyboard and contact the Editor of Romany Routes – Sharon Heppell – at: editor(at)rtfhs.org.uk (Just replace the ‘at’ in the address with the @ symbol.) Or write to: Flat 53, 41 Provost Street, London N1 7NB. And remember: because we deposit every edition of Romany Routes with the UK’s five copyright deposit libraries – such as the British Library – anything you contribute to Romany Routes about your family and your research will be preserved so that future generations will be able to read, learn from and enjoy your work. What do people say about Romany Routes? This page last updated: 3 April 2018.